Work operations: Domestic Water, Sanitary Sewer systems, Storm Drains & Fire Service lines. Working for DF Chase, Inc. of Nashville Tennessee was a very enjoyable experience. The management staff was very professional and the client EMBRAER Exec. Jets were very straight forward with their goals. ACI convinced DF Chase, Inc. to give us an opportunity to demonstrate our abilities. We exceeded their expectations and showcased the quality workmanship ACI has to offer the industry. The work operations consisted of a variety of tasks and we stood true to our agreements. We just sent out a letter of warranty that had expired in August 2009 for the one year of responsibilities we accepted as the sub contractor of choice for all the underground utilities. “Never had we had to go out to the site to check on any of our work- “Testimony of quality workmanship”. Our drill division works throughout Arizona addressing installations of a variation of product types. Some include Cable installations, HDPE, PVC, and Steel casings. To be successful we become very familiar with the ground conditions and surroundings involved. Our parameters with our HDD machines are: A) Distance- 500 LF. B) Product size up to 24” depending on soils conditions and length. 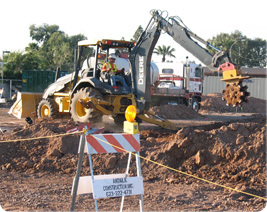 ACI works with the underground community in Arizona. Our success is measured by the high number of return clients. We target all projects as “repeat clients”. SRP-APS-Qwest Communications, Cox Communications, City of Phoenix IT Departments/ Traffic Signals, City of Glendale –IT Department, Phoenix Sky Harbor International Airport. 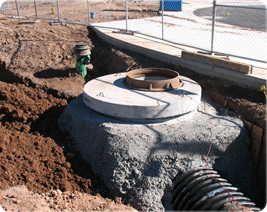 This project consisted of addressing large sizes of Storm Drain pipe (diameter 24” to 36”). 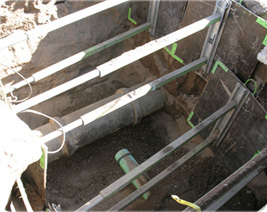 We installed many catch basins, poured in place together with the manholes. A guard shack facility was constructed by others and ACI provided the Sanitary Sewer and water installations. There were many water services to be removed and Fire service lines to install. Working with Kiewit was a great experience and a pleasure to showcase ACI’s commitment to Safety, Quality Workmanship and Professional Standards. Contractor - Contract amount $230,000.00. 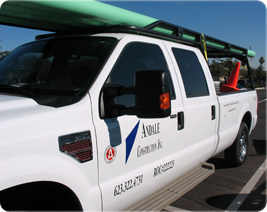 Andale Construction, Inc. worked very close with coordinating other work operations going on at the same time. We find that communicating and working together with project participants rewarding. We typically share common goals to provide quality service and to work in safe work zones. Working on two park and ride locations for MRM Construction Services was a very good assignment for ACI. We were able to complete the Washington & 38th Street PR and move onto the other PR on Camelback near Central. 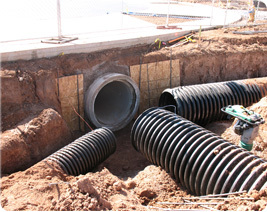 We installed Storm Drainage facilities and addressed 8” VCP Sanitary Sewer/ Removals and Manhole Installations on the project at Camelback Rd. The Don Mensendick Elementary school (City of Glendale, AZ) was a time-sensitive project. We had to leave sections of work incomplete due to the school schedule and address some of those work operations during school holiday breaks. Then return and accelerate the production schedule to meet the project timelines to allow the children back to their classrooms. ACI addressed all underground utility work associated to McCarthy’s building of a new 2 story large added class room building. McCarthy Builders was very impressed with our services and work ethic in and around the school grounds. 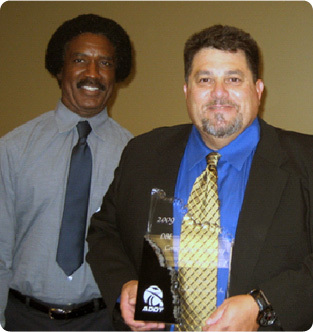 The Arizona Minority Business Enterprise Center (AMBEC) in June 2008 awarded Andale Construction Inc a prestigious award: Arizona's Minority Contractor of the year. We credit this achievement to our clients because they have given us the opportunity to showcase our experience and work ethic. AMBEC is operated by Arizona Hispanic Chamber of Commerce Foundation and funded by the Minority Business Development Agency (MBDA), U.S. Department of Commerce. The opportunity to represent our ADOT DBE program as the Contractor of the year is a great honor. We’ve had the great pleasure of working with our DBE community. It has provided a great sense of TEAM work and it has helped us collectively learn business development practices. ACI would like to thank Mr. Edward Edison and the entire Civil Rights staff for their commitment and dedication to bringing training, education and special skills to all DBE’s in our community. Preparing a company to work with General Contractors & Primes within the ADOT procurement guidelines is the target we all should be preparing or already be prepared for. Prioritize to address your AFR’s (Administration, Finances, and Resources) and when called upon to perform you are ready, willing and able to TCOB (Take Care of Business).